Current technology meets hands on learning and competition with STEAM through computers, electronics and robotics in the Makerspaces. Providing access to technology is one of our target initiatives in Uganda. What started as a collaborative effort between US charity, Hackers for Charity, we now have developed into three distinct makerspaces in three different communities. Each of our STEAM spaces are locally run and monitored, and provide free access to local youth interested in computers, engineering and making. They serve as opportunities for high-tech, 21st century learning that is not accessible to many students in developing countries like Uganda. 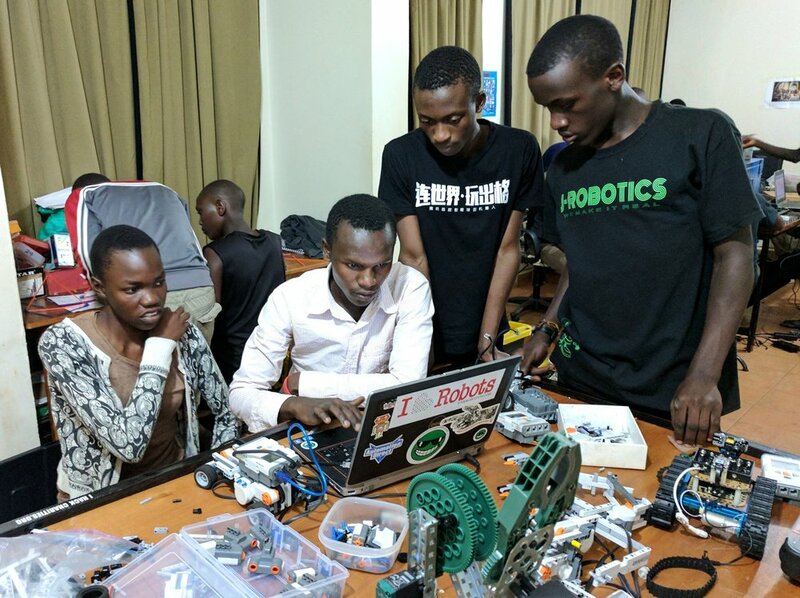 The Hackerspace, sponsored and developed along side Johnny Long of Hackers for Charity, is where our largest programs take place and is located in Jinja, Uganda. This is where we founded and continue to run our first competitive robotics team “J-Robotics”. Our second space is the Nazigo Makerspace which runs out of St. Kalemba Senior Secondary School and is home to our second competition robotics team “The Fusbots”. Finally, we have just started our third makerspace which is dedicated to younger learners. This 3rd makerspace, the Community Tech Centre, is the first we will have built the facility for, as well as equipping and running programming in it. We included this dedicated secured facility as part of the design in the architectural plans of “Our Dad Primary School”. The equipment we have been able to bring to these spaces includes donated robotics kits like Lego EV3 and NXT, VEX IQ & EDR, Ozobots, Hexbugs, Makeblock, and even a complete FIRST Robotics robot kit of parts! We also have some electronics kits like Makey-makey and LittleBits , a variety of Arduino boards and kits, Raspberry Pi and laptops with different software from Visual Basic to Adobe Premier. The random “junk” that the kids salvage locally are used too, as they tinker, build and reverse engineer and combine these with kits to make some pretty unique and innovative prototypes and working projects. From cardboard, broken headsets, old radios, wires, dials, buttons and scrap wood - you name it, it gets re-purposed and used in some way! Student projects that have come out of the space are amazing. Robots that can lift, move and track, Android phone apps that provide phone security, a mobile safety app that was in response to a series of ongoing kidnappings of local girls, a motion sensor alarm system for the hackerspace door, conceptual game animations for an online competition, a how-to video, a server and app system that can send commands to other robots overseas and even a home made drone! The students also have the opportunity to take part in a large scale international robotics event called GISU Tech. This event typically only invites and hosts IB, Camridge or private education institutions from many countries, but our students are the only publicly governed schoo - and they KILL IT! They have been remarkably successful and for the last 2 years of their participation have showed everyone that robotics aren’t just for rich kids and fancy educational institutes. The students on J-Robotics and the Fusbots won medals in every category they took part in: Lego Line Follower, Open Line Follower (we used VEX EDR), Lego Sumo, Original Mobile App and Hardware Control. The veteran students who access the Hackerspace in Jinja also provide classes in that space. These classes invite groups of children from nearby orphanages and children’s homes to learn about STEAM by building robots of their own using the equipment and kits. We have developed activities and programs that range from day long to month long sessions and have hosted the children and caregivers from Mirembe Cottage for Street Girls, Sanctuary Boys Home, Sanctuary Children’s Home and Sera’s Caring Place to introduce STEAM and stimulate interest in the lifelong possibilities when you continue to pursue education! Finally, the robotics students from each of our makerspaces as well as the highly motivated and interested students from our on site outreach programs all have the opportunity to take part in a full day tournament that we design and present to them on an annual basis. These events are extremely well received and provide one more opportunity for the students to showcase their learning, experience the thrill of competition and spread the message that STEAM skills are relevant skills to their future. We are extremely proud of our efforts to bring high-tech equipment, facilities and programs to Ugandan youth and they continue to make us proud every day with their remarkable innovation and what they accomplish as a result of this opportunity!